Deputy Minister for Economic Development Shiham Mohamed Waheed has become the latest Dhivehi Rayyithunge Party (DRP) member to withdraw from the government since the delay of Saturday’s presidential election. Shiham follows Minister of State for Foreign Affairs Hassan Saeed, who resigned yesterday citing the same reasons. In a parting shot, Hassan Saeed told local media that the government had obstructed the election, criticising in particular the new requirement for foreign observers and journalists to obtain special visas and Foreign Ministry approval before entering the country. Sun Online has also reported that DRP member and Chairman of Maldives Post Limited Ahmed Nizam has also resigned. After forming a coalition with incumbent President Dr Mohamed Waheed for the first round of the election – in which Waheed received only five percent of the vote – the DRP quickly switched allegiances to the Maldivian Democratic Party (MDP) candidate Mohamed Nasheed going into the second round. The DRP’s decision was quickly followed by the dismissal of State Minister for Health Ali Shareef, allegedly for his role in his party’s decision to back Nasheed. After the annulment of the first round, DRP leader Thasmeen maintained that his party’s supporters should back the MDP candidate in subsequent poll. The High Court today upheld a Civil Court verdict in April 2011 ordering Dhivehi Rayyithunge Party (DRP) Leader Ahmed Thasmeen Ali to settle an outstanding debt of MVR 1.92 million (US$124,513) owed to Deputy Speaker Ahmed Nazim. MP Nazim, who recently joined the Progressive Party of Maldives (PPM), sued the DRP presidential candidate in March 2011 to recover MVR 1.92 million (US$124,513) unpaid from a loan worth MVR 2.55 million (US$200,000). While the High Court upheld the lower court verdict, the ruling (Dhivehi) invalidated the part of the Civil Court verdict ordering Thasmeen to pay Nazim MVR1,800 (US$140) incurred as lawyer’s fees based on a rate of MVR300 per hearing. Nazim had claimed MVR100,000 (US$6,485) as compensation for lawyer’s fees. The three-judge panel presiding over the case included High Court Chief Judge Ahmed Shareef, Judge Abdulla Hameed and Judge Ali Sameer. The High Court judgment coincided with the launching today of the DRP’s fourth national congress at the Dharubaaruge convention center with 700 delegates. At the final hearing of the Civil Court case in April 2011, Thasmeen’s lawyer reportedly claimed that Nazim agreed to sell Shaviyani Kabalifaru, which was leased for development as a resort in 2005, to raise funds to cover the MVR 2.55 million loan. Thasmeen’s lawyer denied that an agreement was made between the pair to pay back the loan in a month, claiming that Nazim failed to find a buyer for Kabalifaru as agreed upon in November 2008. The lawyer also denied Nazim’s claim that the loan was taken to pay back Thasmeen’s debts at the Bank of Maldives. However, Nazim’s lawyer, Mohamed Saleem, disputed both claims, demanding documentation to prove that Thasmeen gave power of attorney to Nazim to sell the resort. At a previous hearing, Nazim’s lawyer had produced a document with Thasmeen’s signature, prompting Judge Hathif Hilmy to note that the purported loan agreement had a reference number and that it was therefore reasonable to expect Thasmeen to be aware of the details of the amount in question. At the time the case was filed, Thasmeen’s DRP was in a formal coalition with the minority opposition People’s Alliance (PA) led by Nazim and current PPM presidential candidate Abdulla Yameen. The DRP-PA coalition agreement was terminated in July 2011 amidst internal strife within the then-main opposition party, which saw a breakaway faction loyal to former President Maumoon Abdul Gayoom leaving the party to form PPM in October 2011. Following an acrimonious war of words between then-DRP ‘Honorary Leader’ Gayoom and his successor Thasmeen, the former president withdrew his endorsement of the DRP presidential candidate in March 2011. The Dhivehi Rayyithunge Party (DRP) has said it will never form a coalition with the Progressive Party of Maldives (PPM), DRP Leader MP Ahmed Thasmeen Ali told local media. “PPM left because they couldn’t continue with us. So there are no grounds to form a coalition now is there?” another local media outlet reported Thasmeen as staying. “Hereditary rule, we cannot support that. 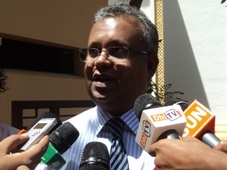 So we cannot form a coalition with PPM,” Thasmeen said. 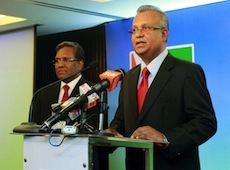 Furthermore, the coalition DRP forms will be subject to who they field as a presidential candidate, Thasmeen explained. 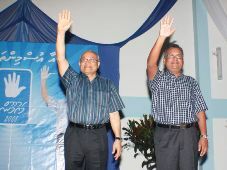 Gayoom formed PPM in 2011 after resigning from the DRP, following a dispute with Thasmeen and the party’s ejection of Umar Naseer. The state has appealed a High Court judgment overruling a Civil Court verdict ordering luxury yachting company Sultans of the Seas to pay Rf110.2 million (US$7.1 million) in fines and unpaid duties. In September 2009, Maldives Custom Service filed a case at the Civil Court to recover US$8.5 million in fines and unpaid customs duties from Sultans of the Seas – a company associated with the family of Dhivehi Rayyithunge Party (DRP) Leader and Kendhoo MP Ahmed Thasmeen Ali – for allegedly defrauding customs to evade import duties for two luxury yachts. At a press conference in June 2009, Director of Customs Abdul Rasheed Ibrahim revealed that Sultans evaded import duties for two Italian Azimut yachts, imported in December 2007 and March 2008. “In the invoices, they said they purchased two used launches,” Rasheed explained, adding that an investigation by the customs internal audit discovered that Sultans had purchased two of Azimut’s latest models, which cost 12.3 million euros or Rf226 million (US$17.7 million). However, the quoted price in the invoices and documents the company submitted to customs was Rf18 million (US$1.4 million). While the Civil Court ruled in favour of customs in late 2009, the High Court overruled the verdict late last year. According to local daily Haveeru, at the first Supreme Court hearing last Monday, State Attorney Ahmed Usham explained that the state decided to appeal the High Court ruling because the evidence was sufficient to establish fraud as documents submitted by Sultans claimed that the vessels were used when the two luxury speedboats were brand new. The fraud was discovered when information was clarified through the Bank of Maldives Plc Ltd (BML), Usham added. Sultan’s attorney Ibrahim Riza however argued that Sultans should not be held responsible for the actions of the former collector of customs and insisted that the Bank of Maldives documents did not clearly state that the vessels were new. Adjourning the hearing, Justice Ali Hameed said a further hearing would only be held if the court wished to clarify certain matters after studying the appeal. In May this year, former Principal Collector of Customs Ibrahim Shafiu, also ex-registrar of DRP until the 2008 presidential election, was charged with corruption for his role in the Sultans fraud case. Shafiu had been living in Canada since former President Maumoon Abdul Gayoom’s election defeat and returned to the Maldives following the controversial transfer of power in February. Shafiu was charged with abuse of authority for allegedly helping change details of the yachts through his influence over the valuation committee to decrease duty payable for the vessels. The former DRP registrar pleaded not guilty to the charges. Meanwhile in October 2011, the High Court upheld Civil Court verdicts ordering Mahandhoo Investments and Kabalifaru Investments – two resort businesses with close ties to DRP Leader Ahmed Thasmeen Ali and running mate of former President Gayoom in 2008 – to repay millions of dollars worth of loans to the Bank of Maldives. DRP MP Mohamed Nashiz, brother of the DRP leader and managing director of Kabaalifaru, and DRP MP Ali Azim, a loan guarantor, were among the appellants at the High Court. Both MPs had signed ‘joint and several guarantee and indemnity’ agreements for the loans issued in mid-2008. In the first case involving Mahandhoo Investments, BML had issued a US$23.5 million demand loan, a US$103,200 bank guarantee and US$30,090 letter of credit on July 10, 2008. The second case meanwhile involved a US$3.3 million loan issued to Kabaalifaru Investment and the appeal of a Civil Court verdict on September 30, 2009 ordering the company to settle the debt in the next 12 months. Both verdict were however appealed at the High Court and remained stalled for almost two years before the rulings in October 2011. Moreover, in December 2009, the Civil Court ordered Sultans of the Seas to pay over Rf654 million (US$50 million) in unpaid loans, fines and accumulated interest to the Bank of Maldives in the course of one year. Ruling in favour of the bank, Judge Aisha Shujoon said the company was liable for loans of US$15.3 million, US$8.7 million and €12.5 million as well as US$500,000 in combined credit limit facilities as agreed upon in June 2008. The judge ruled that records and documents presented to court proved that as of December 7, 2009, Sultans owes US$18 million on the first demand loan, US$10 million on the second and €14 million on the third. In a BML audit report released in January 2009, Auditor General Ibrahim Naeem warned that defaults on bank loans issued to influential political players could jeopardise the entire financial system of the country. Over 60 per cent of the US$633 million worth of loans issued in 2008 was granted to 12 parties, the report noted. According to the report, US$45 million was issued to Sultans of the Seas and US$36 million to Fonnadhoo Tuna Products, two loans which comprised 13 per cent of the total loans issued in 2008. The report noted that Fonaddhoo was owned by DRP Leader Thasmeen while the owners of Sultans of the Seas were closely associated with the former minority leader of parliament. The main opposition Dhivehi Rayyithunge Party (DRP) will vote against approving the reappointment of Dr Ibrahim Didi as Fisheries Minister, DRP Leader Ahmed Thasmeen Ali declared today. Dr Didi, newly-elected President of the ruling Maldivian Democratic Party (MDP), was appointed Minister of Fisheries and Agriculture by President Mohamed Nasheed this morning, one year after Dr Didi resigned along with the entire cabinet. Speaking to press outside parliament today, Minority Leader Thasmeen said that the DRP decided not to endorse the appointment as Dr Didi was among seven ministerial appointees who did not receive parliamentary consent in November. The DRP Leader argued that Dr Didi “lacked sincerity” for accepting the post after pledging to devote all his time to managing the party in his campaign for the MDP presidency. Thasmeen urged “other opposition parties working with us” to vote with the DRP to reject Dr Didi’s reappointment. Asked whether the party would approve the President’s nominee for Defence Minister, Tholhath Ibrahim, Thasmeen said that a decision would be made after evaluation by committee. The DRP MP for Kendhoo noted that the party had voted against the reappointment of former Attorney General Dr Ahmed Ali Sawad for a second time. 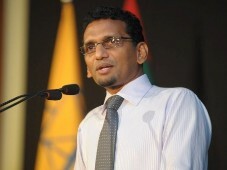 Acting MDP Chairperson “Reeko” Moosa Manik has meanwhile congratulated Dr Didi on his reappointment to the cabinet. Dr Didi insisted that his acceptance of the post did not contradict any campaign pledges. Didi dismissed Thasmeen’s contention that the decision to reject the reappointment was a question of principle: “By ‘principles’ what he really means is ‘politics,'” he said. Dhivehi Rayyithunge Party (DRP) Spokesperson Ibrahim ‘Mavota’ Shareef has questioned the “sincerity” of his party’s honorary leader, Maumoon Abdul Gayoom, claiming the former president is behind “all the problems” currently facing the divided opposition group. The comments were made after former President Gayoom yesterday addressed members of the media upon returning from a visit to Bangladesh to criticise the appointments of two new DRP deputy leaders without holding elections at a national congress. Speaking to Minivan News, Shareef said that claims by Gayoom, who became the party’s honorary head after retiring from active politics in 2010, were intended to “deceive” DRP members and supporters. Shareef alleged that Gayoom was personally responsible for the addition of a clause within the party’s constitution that allows for the replacement of vacant senior DRP positions outside of an official national conference vote. Appointments have become one of the main points of contention for the DRP of late after the dismissal of its former Deputy Leader Umar Naseer. This dismissal was linked to the eventual formation of a spin-off movement within the party known as the Z-DRP. The formation of this spin-off group has led to an increasingly acrimonious relationship between serving party head Ahmed Thasmeen Ali and Gayoom himself. However, Shareef claimed that Gayoom had personally approved amendments to the party’s constitution during the previous national congress that allowed for the DRP’s council to approve deputy leadership roles to replace departing members. In addressing how Gayoom’s latest criticisms could affect attempts by some councilors to try and reconcile divisions within the DRP, Shareef again questioned the sincerity of Gayoom in trying to find a resolution for the party. However, upon returning from Bangladesh, Gayoom told members of the press that the solution to the internal rifts within the party was to respect its charter and retract the DRP council’s actions in appointing and dismissing deputy leaders; actions that he contends were in violation of the organisation’s charter. Gayoom argued that the recent appointment of MP Mohamed Ramiz and council member Ahmed ‘Anday’ Mohamed as DRP deputy leaders was not legitimate, as article 87 of the charter states that if a deputy leader resigns, a replacement should be elected at a national congress. However, the DRP insists that article 122 of its charter authorises the council to temporarily replace vacancies in elected posts until the next congress. Of the four deputy leaders elected during the DRP’s third national congress in 2010, Umar Naseer was contentiously dismissed by the party’s disciplinary committee, while MP Ali Waheed later defected to the Maldivian Democratic Party (MDP). Umar Naseer meanwhile contested his dismissal at the Civil Court, which is due to rule on the legality of the decision. Gayoom also denied that remarks made at a Z-DRP rally last month about regretting “handing the [leadership position] on a platter” was a personal attack on serving DRP Leader Thasmeen. Tomorrow’s sitting of parliament has been cancelled to allow political parties to resolve a protracted dispute over the composition of standing committees, following the defection of two opposition MPs to the ruling Maldivian Democratic Party (MDP) several weeks ago. After adjourning today’s sitting twice to continue discussions with parliamentary group leaders, Speaker Abdulla Shahid announced the cancelation of both today and Wednesday’s sittings shortly after 1:00pm to grant an additional day for the parties to reach a compromise. If the talks were to end unsuccessfully, said Shahid, the matter would be brought to the floor for a final decision when parliament sittings resume on Monday. Parliamentary committees, which reviews approved legislation and exercises oversight over the executive and independent institutions, have not been functioning since the beginning of the current session. The dispute has centred on which party would control voting majorities of powerful committees such as the ‘241’ (National Security) Committee, Economics Committee and Public Accounts Committees (PAC), all of which are presently chaired by opposition MPs. Under article 170 of the Majlis rules of procedure that stipulates proportional representation, MDP are assured five out of 11 seats in the committees (45 percent) and four for DRP-PA (39 percent) while the two remaining slots must be filled by either Independents or MPs of minority opposition parties Dhivehi Qaumee Party (DQP) and Jumhooree Party (JP). Eight Independent MPs and four minority opposition MPs together account for 16 percent, posing a dilemma in dividing two seats among them. At a press conference yesterday, MP Ibrahim ‘Ibu’ Mohamed Solih, newly-elected parliamentary group leader of the MDP, explained that the ruling party’s share of parliament (up from 39 percent to 45 percent) should be reflected in the committees. The MDP MP for Hinnavaru revealed that the party was ready to accept a compromise of “six committees for us and the other six to the DRP-PA (Dhivehi Rayyithunge Party-People’s Alliance coalition),” adding that MDP was willing to leave the position of deputy chair of MDP-majority committees to the DRP-PA.
DRP Leader Ahmed Thasmeen Ali meanwhile told newspaper Haveeru that the opposition would require half the seats of the Security Services Committee and the PAC in particular. The embattled opposition leader argued that the opposition could not hold the government accountable should it lose control of committees designed to watch over executive functions, suggesting that the talks had stalled over this point of contention. Thasmeen said that the crux of the problem was the fact that neither the MDP nor opposition parties controlled a clear majority of 39 seats in parliament.